Victoria Falls Bungee Jump | Reason for goal reassessment? 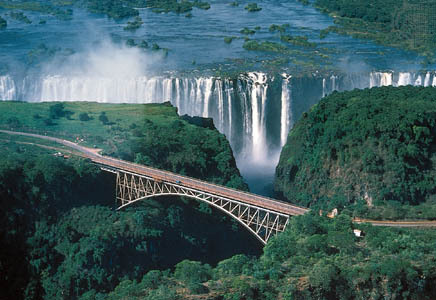 So with the recent headline of a Victoria Falls bungee jump gone wrong on the Zambezi means that some 2012 goals may need rejigging. An Australian girl miraculously survived a bungee jump after the bungee cord snapped sending her straight into a crocodile infested Zambezi River. The interview and video of the fall can be found on the BBC News site. So does this make me want to cancel my plans for bungee jump this year? Part of me thinks I have lost my marbles if I still go ahead with this and the other parting is screaming the word “chicken! !” I guess we will see which part is packing the bags come September when I head back to Zambia to be an adventure-seeking tourist in my own country. This does of course throw up so many questions about the care taken in making sure the equipment was/is regularly checked and inspected by independent bodies. The vendor apparently hasn’t had any accidents of this nature in over 2 decades but one must take into account that this is an extreme sport and with that comes many risks. You must always ask many questions before taking anything like this up and if things just dont feel right then its ok to back out. If bungee jumping is not your thing then can try white water rafting in what is often listed as one of the seven wonders of the world. Victoria Falls churns up torrents of raging whitewater, so for any thrill seekers into water sports this is the place to do it! Moving on..Lots of things happening this month, hopefully I won’t get myself overwhelmed before the first month of the New Year comes to an end. I am going to the Outdoors Show this Sunday at the Excel Centre. I also have master classes run by Libby Peter and Lucy Creamer, two of the top female climbers in Britain. I also have a DMM session on putting in gear into rock in preparing for a more outdoorsy 2012. So I will be sure to get some pictures and post a review next week. As my other goal for this year involves giving back to the community, I am meant to go for mentoring training in Dalston on Thursday evening (tomorrow) at The Petchey Academy. How this is going to happen tomorrow is yet to be sorted as I have a course at work until 6pm. There is also an MTV presents Emelie Sandé gig on the 25th of January as well as a few other events which I have yet to sit down and work out how I can fit them in with work but all will be revealed and posted shortly. Continuing with theme of giving I have also been in contact with Amy Ward (blogroll listed) who has been part of many community and charity projects. I will be reaching out to her for more info on how to get involved should anyone reading or following my blog want to help or get involved in charitable events. I seem to be filled with benevolence this year and feel like rather than donating £2 monthly to a charity I think going that little extra mile of getting involved is not only satisfying but they say giving is good for your health too! Who knew?!.. So have you seen and heard the thunderous Victoria Falls? Please don’t forget to “like” me on Facebook if you haven’t done so already! Thanks for your support!